Creating emails can either be a laborious task or quick and easy, especially if you know how to do it. That´s why, Email Marketing templates are the ideal solution for putting together and highlighting your content while saving you hours of work and also keeping your costs down. Platforms like MDirector put at your disposal a variety of ready-made email templates. They are already set out by category and theme and can be a great solution for creating emails in just a short time and with little resources. In addition, all of the templates can be modified so you are able completely adapt the look and feel to fit your business. They are also available in desktop and mobile versions. One area that MDirector offers free email templates is “Hospitality”. In this section there are a total of 10 templates available to you and they cover everything from hotels, pizzerias and restaurants to nightclubs and discos. Here there are 10 examples of free Hospitality templates that MDirector makes available to you. This template contains two columns with a right sidebar and is a predominantly black, which allows the photos to really stand out. It is a basic template that has a simple design and only a few elements. From the top, the template begins with a large header that shows the company’s logo, next comes the first piece of news or selected content with a large picture which takes up the entire width, then a blue title and a small piece of text. In the bottom half you can find two columns. The column on the left has a different content with a small photo, a pink title and again, a small piece of text. On the right there is another column that shows a title and a text. This template lets you to modify all of the elements and is ideal for introducing links to social networks or adding striking images. The column on the right could be used for contact information and social networks. The other two elements could be used for the highlights of the message such as offers to visit your local bar or a special show that is happening at the club. This email-marketing template is very visual and easy to work with and can bring a lot of benefits to your local hospitality business. In the Health and Beauty category there is only one example and it is a completely different design compared to the one used in the hospitality. 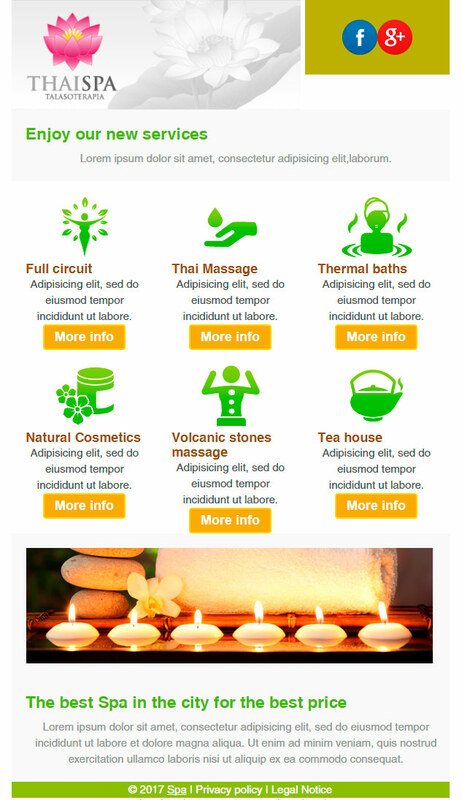 This design called “Spa” is a nice email template. The white background and soft colours help to highlight your relaxing and healthy message. It is a template that is used by most cosmetics and spa catalogues and those offering skin care treatments. This template allows you to highlight the most important aspects of your business. Some of the elements catch the eye because they are accompanied by green icons, which help to summarize the content well. In addition, there is a small headline and a brief passage of text that completes the information. The template is headed by the most important content, the company`s logo and a suitable box to incorporate links to social networks. The templates for travel agencies use a completely different style which are out of this world. 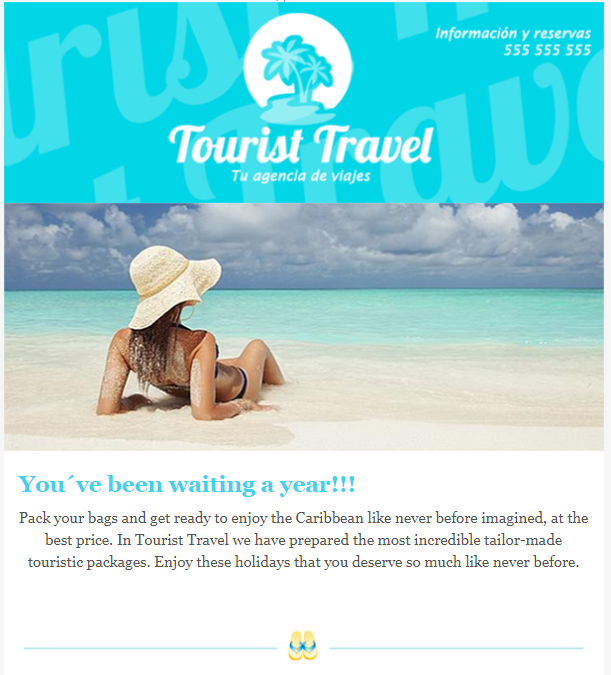 MDirector offers you up to 6 different free templates for your travel business. It’s another one of those templates where the colour white predominates. This helps to make the rest of the content really stand out, as it doesn’t attract attention while strengthening the message of the images and the other elements such as text. This template is ideal for travel agencies, as the photographs take centre stage and is perfect for showing what’s best about travelling. The photographs are a common theme for this kind of business and they are used in the hope of selling more trips by showing off the stunning scenery of the destination. There is also the possibility of adding text and titles. All of this blends in well with the blue, which is the templates default setting, but don’t worry, all of the elements in the template can be modified to your tastes. This is a common newsletter that businesses send to congratulate someone. MDirector knows that there is the need to build mailings that offer congratulations to people, clients and other companies. That is why there are 4 different kinds of email template available. In the example we can see how the content is much smaller than in the other examples. It’s important to know that you don’t have to overload the message with too many items; otherwise the recipient could feel a little overwhelmed. On many occasions less is more, as shown in the example. You can celebrate Christmas, or another festival by highlighting the idea with a great image and modifying the title and text. You can’t forget about the identity of your company therefore the company´s logo and colours should take pride of place at the top, right on the header. On the other hand you can also add a light grey as a background with links to social networks so that your clients can share your felicitations with their friends and followers. As the template shows, remember that you don´t need too many elements in your messages. Probably your clients may only need emails like that with just messages, a few extra elements and a lot of imagination. Another strong category among the MDirector email templates is “Ecommerce”. It has 10 templates that can cover the needs of business ranging from discount brands, wine merchants, technology companies, outlet stores to coupon sales. Here we have highlighted the example for coupons that, like nearly all of the templates we have see so far, is available in mobile version. This template is perfect if your business is going to offer coupons to its clients that they can then use in your store. 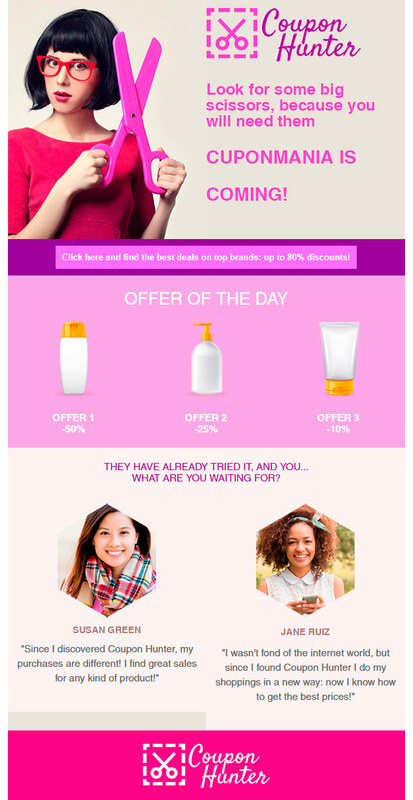 The coupon can grab their attention using different shapes, colours as well as highlighting the products. It is a subtle template despite the amount of elements in it. The header is simple and the logo and photo are on neutral-coloured backgrounds. 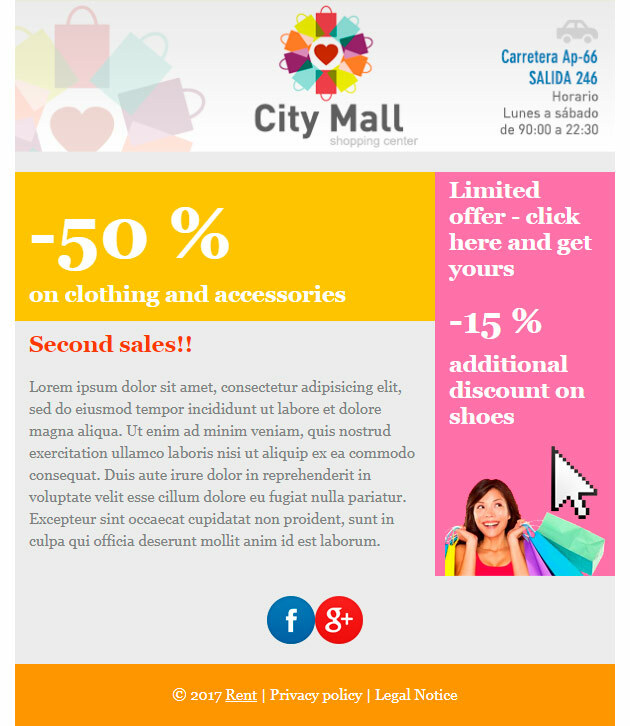 Then there are 3 highlighted elements, which are part of the offer. Finally you can add two client testimonials sharing their experiences about these deals. Find out what offers are available. What products you can buy with this coupon. Why is the coupon worth it? Grab the attention with the name and links to the company. 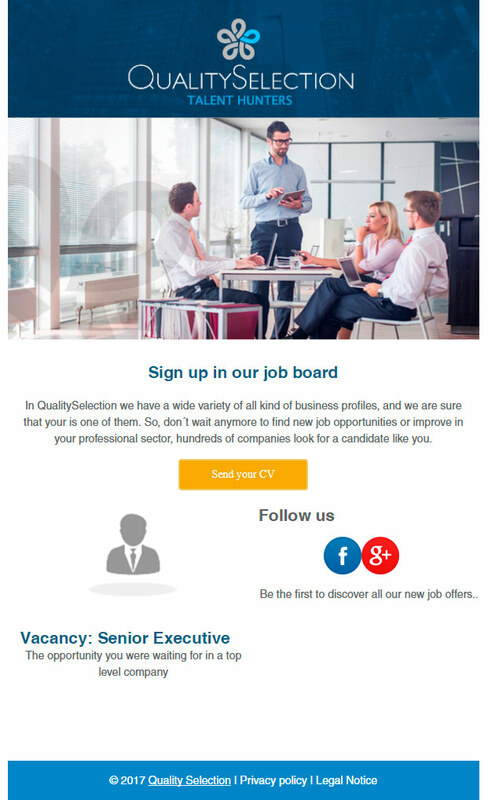 The sixth category of email template available through MDirector is Education and Employment. The 9 templates in this section make special reference to academies and companies that offer jobs. Here we have highlighted the template for academies. In it we again see how important the images are. Like travel agencies, schools and academies use the pictures to sell the benefits that they have to offer. In this template you can see that there is one specifically highlighted piece of content and 3 other little pieces that complete the offer. The Images are also the centre of attention. You can also find short titles, a summary text and a call to action button. The template is rounded off with a space allowing for links to social networks to be added. Here you can also add ways to be contacted such as a telephone number or an email address. Finally, as seen in the other examples, the name of the company and their logo are what stand out and lead the template. This is essential, as it’s important for the users to be able to immediately identify who the mailing has come from. 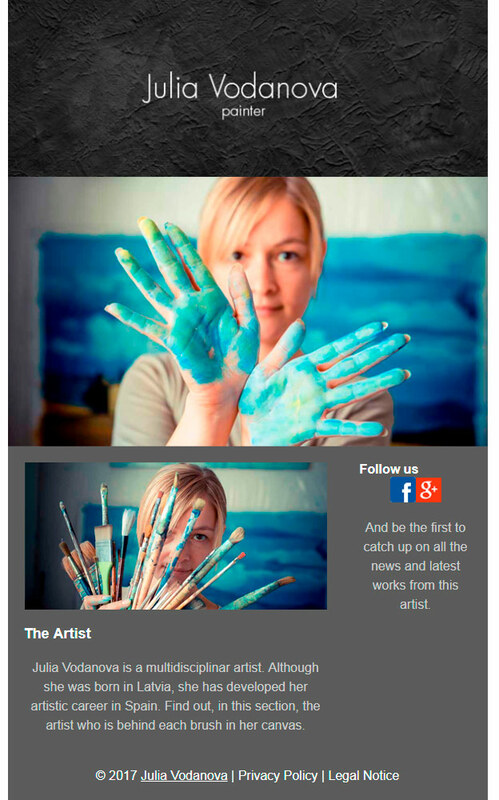 Artisan email marketing templates for the crafts sector are also available on MDrirector and they follow along much the same lines as “Health and Beauty”, opting for a minimalist look using light colours. The example shown is intended to highlight the work that has been done. That’s why the header that includes the company’s name is accompanied by large images of the products that have been created. The text is slightly bigger than normal but sometimes it is important to really emphasize how the products were made, what materials were used and also the story behind them. Even though this template includes all of these elements, it doesn’t feel overwhelming and is nice and easy to read. 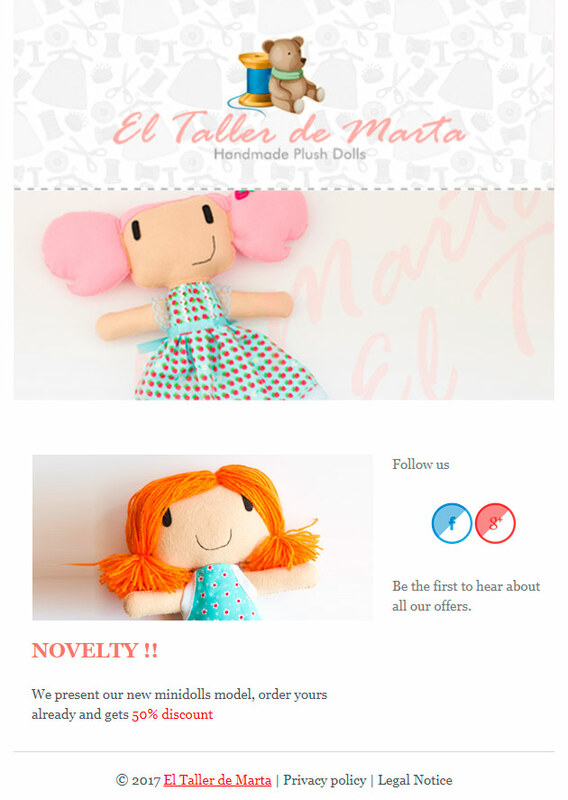 The friendly appearance of the layout helps with the theme of selling children’s dolls. Don’t worry though; you can modify the colours in MDirector to suit your corporate image. The Entertainment and Arts templates are design to talk about the professionals in the industry. They are basically made to highlight how they do their job and show their work to the audience. In the selected template there is only one piece of highlighted content: the one in the middle column. So you can then add the contact details and social networks links in the column on the right. As we can see in this template, the images again play an integral part and carry a certain weight to them. The best way to get to know the professional in this field is through a photograph. Always try to use images that are representative of the content that you are trying to highlight. The penultimate category offered by MDirector is for NGO’s. 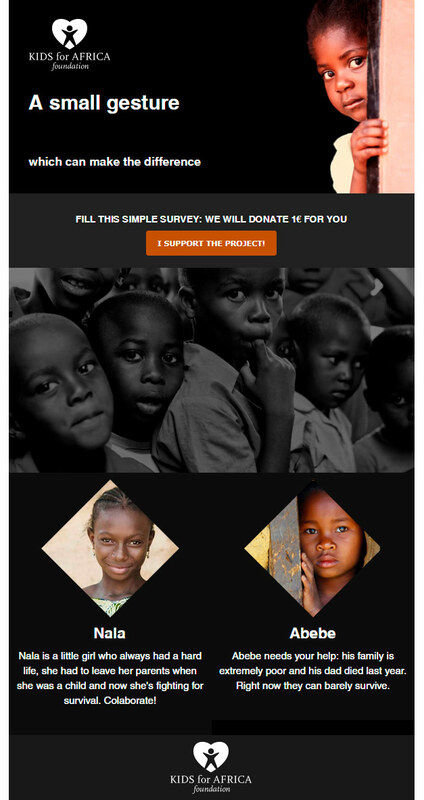 There are 2 templates available and they highlight the humanitarian work done by these organisations. Sobriety and simplicity are the key elements in this outstanding template. The images again dominate and are main the protagonists of the content by highlighting the faces of the people who can be helped through the NGOs. The black design conveys the necessary seriousness of the template. The NGO or the copy is not what’s important here; the most important thing is the people who are portrayed. As with white, black also allows the attention to be drawn to the elements of colour, in this case the photographs. The last template that we are going to look at deals with “Businesses”. The example that you can see is for a Shopping centre, but it can work equally well for other businesses such as estate agents and gymnasiums. The coloured elements are the main focus in this type of template and they play a fundamental role, as shown in the example, their objective is to create campaigns that quickly catch the eye of the visitor. That’s why, choosing the right selection and combination of colours in your template can bring success. In terms of a business, the colours should always follow a pattern by respecting the colour scheme and identity of the brand. That way, you won´t have to spend that much money trying to convince your clients if you use the already well established colours and elements of your company. 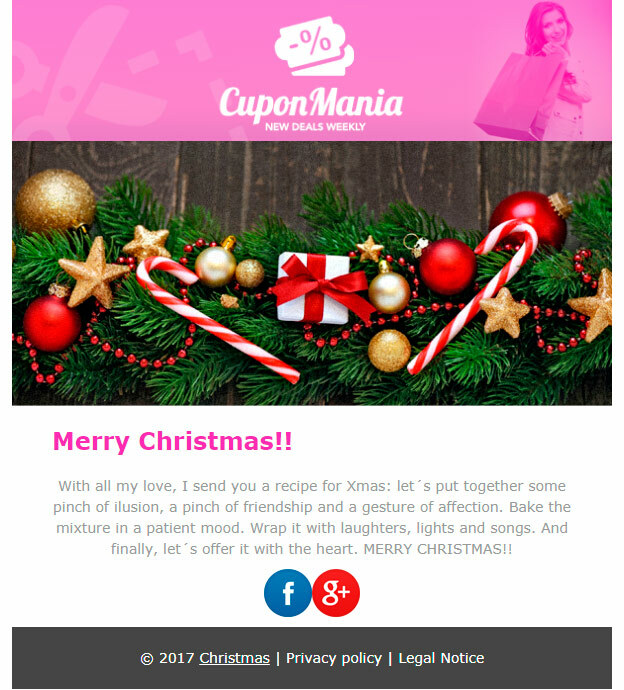 All of these email marketing templates and much more, are available on MDirector. Try it today, and start working on these magnificent free thematic templates that you can edit and adjust to suit your needs. That’s why, MDirector is the ideal solution for creating the best Email Marketing campaigns out there.